Versatile Blogger Award – TWO NOMINATIONS! WOW! I have been given this award by two fellow bloggers. I am humbled to have received it twice in the past week. This is my third award. Before I get to the rules I would like to thank Connective Tissue Disorders and The Allergista for giving me this award. Thank the person/persons who gave you this award and include a link to their blog. Tell the person/persons who nominated you 7 things about yourself. I never learned to skate. I love to sip a good cup of strong hot green tea and despise coffee (even the smell of it). When I have a reaction, my right hand turns cold but not my left. I love to bake even if it is just to give it away. I can’t whistle no matter how hard I have tried or how many have tried to teach me. Hold the Sulfites – I discovered this blogger after posting about sulfites on my blog. Rarasaur – I love the writings on this blog. Bored Sick – The story of a young woman dealing with dysautonomia . Adventures of an Allergic Foodie – I just found this blog and am excited to read more. August McLaughlin – I recently discovered this blog about writing. August hosted the recent Beauty of a Woman Blogfest that I participated in. Oh What a Pain in the… – This blog talks about living and coping with chronic pain. Sprue Story – humorous look at living with celiac disease. West Coast Posse – She talks about her struggles with infertility and there is a link to her blog Gluten Nazi Mom Blog where she talks about going gluten-free. The Other Courtney – A sleepwalker who also talks about her allergies. Amaryllisturman – She writes on her experiences with products and trips to various eateries. While I have food allergies, I love reading about her food adventures. Quirkywritingcorner – Writes about various things but is also dealing with chronic pain. Relfections of Grace Home – Wonderful Christian writing. Ranting Chef – Another blog that I love to read even if I am not able to duplicate many of his wonderful recipes due to my allergies. Laura Jean Treat – May daughter’s new blog. Her goal when she isn’t too busy with school and studies is to begin a photo blog of our family. This entry was posted in Allergies and Sensitivities, Chronic Illness and Treatment, Depression, Environmental Illness, Food Allergies, Multiple Chemical Sensitivity, Reactions and tagged acute allergies, chronic illness, environmental illness, food allergies, fungal infections, invisible illness, multiple chemical sensitivity, Versatile Blogger Award. Bookmark the permalink. congrats wow your getting to be a star lol are we going to see you soon on tv with your book that would be cool have fun. You are welcome Kim. 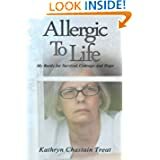 When I started this blog to 1) Promote my book and 2) Create awareness of chemical sensitivity and mold illness, I had no idea I would meet so many wonderful bloggers out there. I truly enjoy reading and interacting with so many. I hope you enjoy them as well. Congratulations! I visited some of those blog sites you listed. I hope all is well with you and your family.